In Fine Jewelry > Pendants > Show & Tell and Animals > Show & Tell. Tiger claw jewelry became popular during the British colonization of India during the Victorian period. This period was known as the British Raj (Hindi for 'rule'). The pieces were produced to appeal to the British travelers as souvenirs with an Indian flare. This craft is now banned which makes the older pieces very collectible. Although jewelry made from animal products not to hear my favorites I fall anyway for special jewelry like this pendant. Made of a tiger claw acid test for 9 / 14K Rose Gold combined with two Elk teeth. This pendant comes from Germany and there we often see jewelry with animal teeth . The German call this : Grandle. 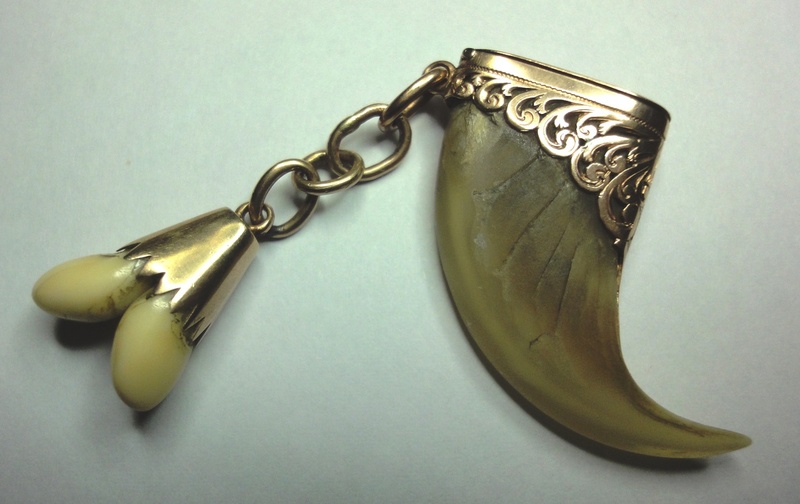 What is so special on this tiger claw is that there is a lid with hinge at the top with (Essex?) Glass in it. It can open and therefore something in the pendant can be done. Probably used as Tiger Claw Vinaigrette. It does have a small crack in the glass, but it's pretty cut and the lid functioning properly. Vinagrette: Victorian name for little perfume lockets, perforated and containing tiny pieces of cloth soaked in an aromatic vinaigre. aghcollect thanks for your very quick reaction, interest and love. Hi Agram! Your animal teeth are from deer/elk! (Usual hunting trophy in Germany and France). For the claw, it is very special that it have a lid! kyratango thanks for your explanation and love. 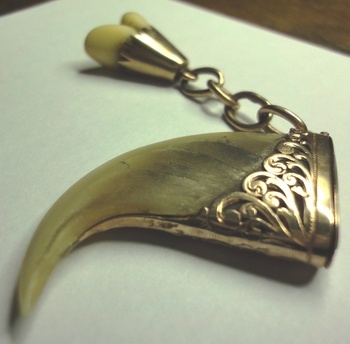 I already know now that the claw pendant was probably used as Vinagrette (see description). I'm always very glad with you knowledge and learn a lot. Roeycroftbooksfromme1 thanks for your nice comment and love. nutsabotas6, vetraio50, blunderbuss2, Jewels and CindB thank you all for your interest and love! Interesting post! And really nice piece! Happy Holidays to you! shareurpassion thanks for your really nice compliment and love, and Happy Holidays for you too, I'll hope we "meet" often on CW in 2015 ! BHock45, southcop, and PatSea thanks for your interest and love in my pieces over this year. Happy Holidays for all of you! 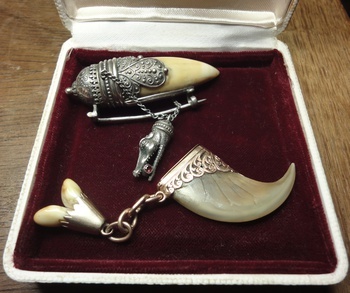 the tooth is Double Elk Ivory . southcop thanks for your comment now I'm sure what it is about. wow! you have some very interesting jewelery Agram.m! ho2cultcha thanks you for your compliment and love. I always do my best to collect interesting antique jewelry, my great passion with preference Micro mosaic and Berlin Iron, Silesian mesh work jewelry.